Blog from Jaipur, India | Harper goes to France! Before leaving Agra we had one more stop in the abandoned city of Fatehpur Kikri. It was originally the palace for the Mughal Emperor Akbar. The city is located on the top of a large hill so we were treated to a tuk-tuk ride to the top. We have been seeing these three wheeled motorized cars all over India but this was our first ride in one. 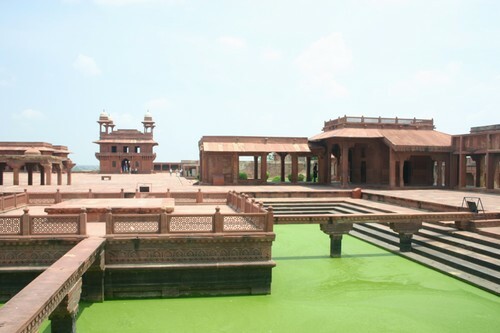 Touring Fatehpur Kikri was like getting a glimpse into all the palace pleasures. We saw the emperor's bedroom with it's amazing views and the area where he held court with his subjects. More interesting were the differences in the bedroom quarters for his three wives. He had a hindu, muslim, and christian wife and each of their bedroom walls were etched with different symbols to highlight their faith. The hindu wife was a strict vegetarian and had her own kitchen and staff to prepare her meals. While touring we continued to be photographed and videotaped by the locals who aren't used to seeing travelers with our skin color. Yesterday a family approached us and asked (more like gestured) if they could have their baby's picture taken with us. Slightly awkward but very sweet. From Agra we traveled 5 hours by car (with our trusty driver Brij lal) to the city of Jaipur. We love our new hotel with its internet service, we got to talk to the big four (Debbie, Darlene, Niki, and Grammy) via Skype last night.